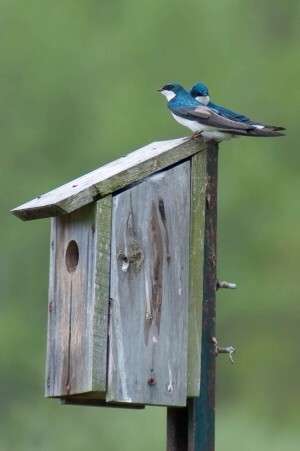 Tree Swallows take advantage of the nest boxes placed around the sanctuary. Location. Location. Location, applies to more than real estate for humans. It is equally important for birds. What do bluebirds, tree swallows, chickadees, and woodpeckers have in common? They’re cavity nesters. They need good locations to nest. During this indoor program, we’ll share information on how to build or buy suitable nesting boxes for a variety of species, the proper placement of nesting boxes in your yard, and how to attract birds and discourage predators to these new locations. It’s never too early to plan for nesting season and some of your most important neighbors. This program does not include building a nest box. Members $5/person, Non-members $8/person.